Want to switch energy providers, but worried about being stuck in a contract? Canstar Blue explains how electricity contracts really work, which retailers will lock you in, and which you’re free to leave at any time. Australians are constantly being told to shop around and find a better deal on electricity – problem is, you’re already stuck in an electricity contract… Or are you? While an agreement with your electricity company is a “contract” in every sense of the word, many customers mistakenly presume this means they can’t leave. What is a “lock-in” energy contract? There are two types of electricity contract – market offers and standing offers. Standing contracts are Government-regulated and will never lock you in. However, they don’t include any discounts and are typically more expensive than market contracts. The conditions of market contracts are set by energy retailers and may include clauses that do lock you in. Market contracts typically come with a benefit period of one or two years (the period of time that you receive the discount), with some including exit fees that effectively mean you are locked you in, unless you’re willing to pay to cancel the contract. After the discount expires, you will remain on the contract but will no longer receive the benefit unless you renegotiate a new deal. This is how many consumers fall into the trap of paying too much. Don’t fall into the trap of sticking with the same energy deal for several years. You will only be ‘locked in’ if the contract has fees for leaving early. These are generally referred to as ‘exit fees’, but you may previously have seen the terms ‘termination fees’ or ‘break fees’ used to describe them. You can see if your electricity deal has an exit fee by checking its electricity price fact sheet. Electricity market offers can include a ‘benefit period’, which may also (confusingly) be referred to as a ‘contract period’. A benefit period refers to the period of time that you receive a discount – it does not mean you are locked into a contract for this period of time. For example, a contract may have a benefit period of 12 months. This means any applicable discounts will only apply for the first year after signing up, while the contract remains ongoing. You can see examples of plans with conditional discounts with our energy comparison tool below. Am I locked in to my energy contract? Contrary to popular belief, most electricity contracts don’t lock you in. While exit fees were common a few years ago, these days, only a few types of contracts include an exit fee for leaving a contract early. The following contracts typically come with exit fees to watch out for. Customers on a fixed rate contract have their rates frozen – usually for a period of two years – helping households to save by temporarily shielding them from rising power prices. This is different to a variable rate contract, which most Australians are on, where the retailer can change your rates at any time. Only a few electricity retailers offer fixed rate products and they usually include exit fees to deter customers from leaving. An example of a fixed rate plan is the Secure Saver from EnergyAustralia. Most one year contracts don’t lock you in – after all, it’s only a year. While exit fees are uncommon across the board, contracts for two or more years are generally more likely to have exit fees included, so exercise caution before signing yourself up to a long contract. Multi-year lock-in contracts usually charge a large exit fee for leaving in the first 12 months, with a smaller fee for leaving in subsequent years. 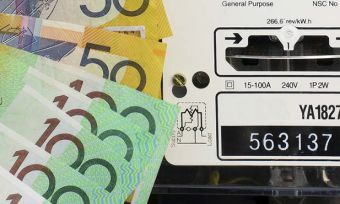 For example, Victorian customers on a two year contract with Simply Energy are charged $143 if they leave in the first year and $49.50 if they leave in the second year. If your electricity contract comes with ‘bonus’ perks, like movie tickets or a smart meter upgrade, then double check there aren’t any exit fees. In the case of a meter upgrade, the exit fee will usually just be the remaining installation cost. How much does it cost to cancel a contract? Electricity contract exit fees can range between $15 and $150, though it’s more common for exit fees to sit around the $20-$30 mark. Exit fees vary between different retailers, so be sure to factor this in when comparing energy deals. So which electricity contracts DON’T lock me in? The vast majority of variable rate market offers do not include exit fees, meaning you’re free to switch providers and shop around for a better deal, whenever you like. If you’re not sure whether your electricity deal includes exit fees, read your energy price fact sheet to find out. If it doesn’t mention exit fees at all, that’s probably because there are none. Where can I find an energy deal with no contract? Most electricity providers with lock-in contracts will also have plans that do not include exit fees. There are, however, some power companies that deal exclusively in no lock-in contracts. The following energy retailers are some of those known for providing no lock-in electricity contracts. Check our energy comparison tool for the latest information on no lock-in contract plans and to see how they stack up on price. Is going with a lock-in contract a good idea? The nature of the energy market means that some of the most competitive deals are only available on a lock-in contract, which includes an exit fees. This is especially true when it comes to fixed rate products, with consumers able to benefit from fixed pricing for the duration of the term. However, you should still be able to find plenty of cheap deals that do not come with exit fees – most of these come with variable rates, so you’ll have to decide what works best for you. Going with a lock-in contract plan could be a good idea for customers who would rather set and forget a competitive power plan for a couple of years. Going with a no lock-in contract plan could work out well for customers who are happy regularly comparing energy offers and switching when better deals come up. Canstar Blue rates and compares about 20 electricity companies across QLD, NSW, SA and Victoria. You can use our price comparison tool to find the cheapest deal in your area, and see which products won’t lock you in with an exit fee.